The importance of neutering and microchipping for cats Cats Protection’s Anglia Coastal offers a special deal on cat neutering and microchipping for the NR30-35 postcode area, our “Snip and Chip” Events take place the first Thursday of every month at the over 60’s club in Clapham Rd, Lowestoft. Our remaining dates for this year are Sept 6th, Oct 4th, Nov 1st and Dec 3rd The cost is just £10 for people on means tested benefits. 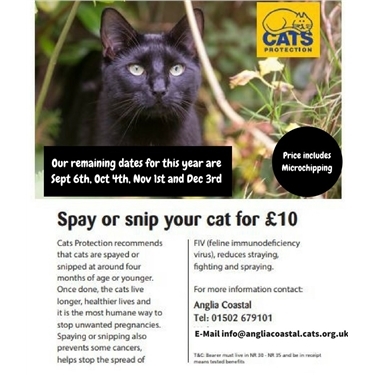 For further information please contact Linda our neutering volunteer on 01502 679101. There is no need to bring the cat/cats just bring proof of your means tested benefit. “Getting your cat neutered is extremely important,” said Christine Cutts Branch Co-ordinator. “Just one unneutered female cat can potentially be responsible for as many as 20,000 offspring in just five years so neutering will help to drive down the number of unwanted kittens in the future.” Our branch continues to be inundated with abandoned kittens, unwanted litters, stray/abandoned pregnant cats and this year has probably been the worst since we opened in 2015. So far this year alone we have re-homed 193 unwanted and abandoned cats and kittens. “Neutering also has many benefits for the health of your cat. They will be less likely to roam, to spray and to fight, reducing the possibility of contracting life-threatening diseases that can be transmitted by bites and saliva.” “Having a cat microchipped will give cat owners more peace of mind if a pet cat should ever go missing” Microchipping involves a small data chip, no bigger than a grain of rice, being inserted under the cat’s skin under the shoulder blades. The details are then stored on a national database and can be accessed by scanning the animal with a special device. Most vets and rescue centres routinely scan all lost cats and can use the information to quickly reunite the missing pet with their owner, provided that owners keep their records on the national database up to date.